I was looking at a new weather app to check when the late-summer drizzle was going to stop and got a nasty shock. A rain warning. We live in Vancouver, a notoriously rainy city. A warning that there will be heavy rain has to be taken seriously because we usually just pretend that it’s not happening. But as climate change happens (and happens to us, we can’t avoid it) we must expect more hard rains, more frequent, more severe. it seems to me that we have chosen the perfect roof to handle this kind of weather. 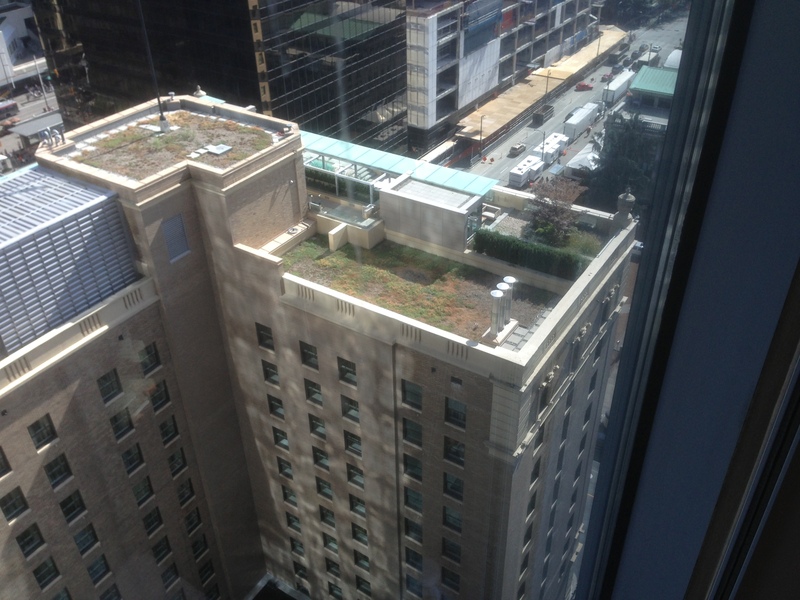 The living roof will soak up the hard rains, holding the bulk of the spate so that it doesn’t overwhelm the water run-off system that can overtax the sewers. The rolled steel roof will slide the water right onto the rain chains and along a pathway we’ll build for it so it gradually gets absorbed. The rolled steel roof is being installed now — yes, in the pouring rain. Here’s the bit of roof right over our bedroom — that will provide us with lovely sound when we are sleeping beneath it in the rain. You see the edging slipped over the under layer, and the steel panels lay over that. Above that you see the window that will nestle between the kitchen counter and the upper cupboards. That’s strapping holding down waterproof paper, with a solid plastic flashing at the bottom, and white flashing around the bedroom window. 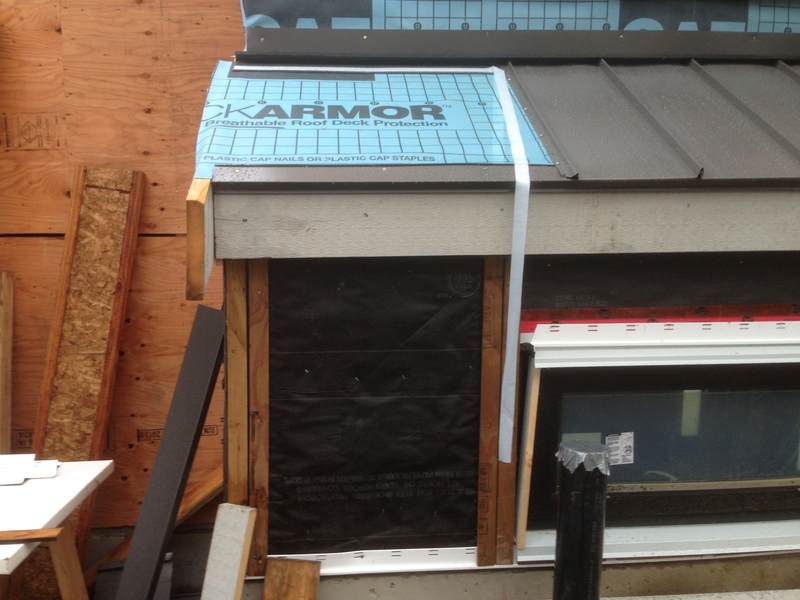 Here’s what the finished roof looks like on the side gable — sharp! More work has been done on the inside — the sprinkler system is in place. We’ve decided on a security provider, so that’s one more thing off our list. Looking forward to the next few weeks, there’s so much work that will be done in just a little while. 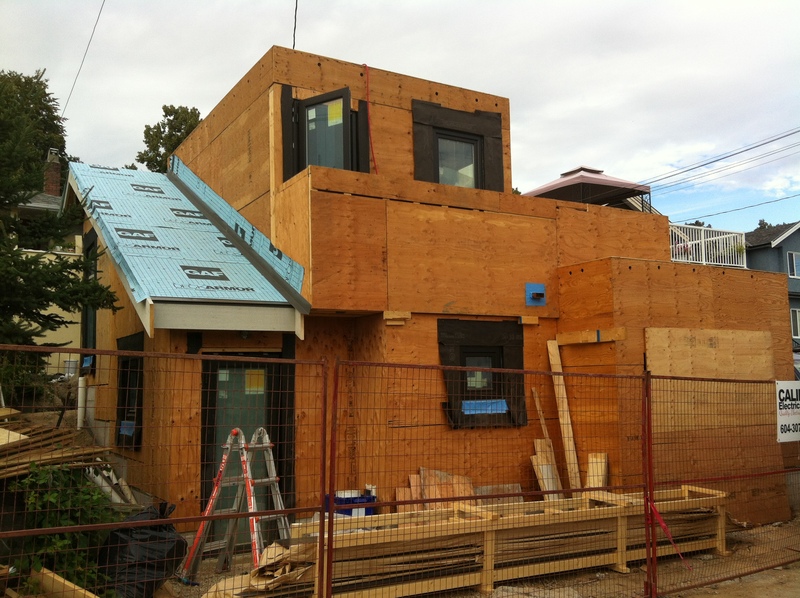 Posted in Laneway House and tagged Lane Home, Lane house, Laneway House, living roof, Small House, Small Style, Vancouver. Bookmark the permalink. Living in the rental space has shown me where my own personal mindless clutter comes from. I’m definitely a piler, not a filer, so I’m trying to work out how best to organize my papers. The first step will be to find “an underused closet ” to put a series of bins or baskets in. And the system has to be super-accessible, so I can just drop papers in every day when I go through the mail — and not have to save them up to “file properly”. I don’t need lots of bins (I have been honing my tossing skills) but just a couple to hold work receipts, manuals, and notifications. Plus it has to successfully hide said paper, so DH doesn’t have his “mess alarm” tripped. And I’m going paperless when I can — bills, bank statements, receipts, etc., but I still have a few. This little interlude is giving me the chance to figure out how many baskets I will need and how they will be labelled. There’s no sense buying them until I have a space I can put them — I want them to fit into an unobtrusive place and I don’t have one of those yet. These are just steps to the final product — a clutter-free home. For. Ever. Posted in Decorating, Laneway House, Minimalism and tagged Lane Home, Laneway House, Small House, Small Style. Bookmark the permalink. Half way through the build! Well we are at the half-way point of the build and although we had a slight setback we are still on schedule and set to finish on time. The hiccup in the plans is because they insist on hiring people to inspect our building! Everyone has a slightly different set of criteria — although the goal for everyone is a finished building that is the best it can be. Although our builders have a lot of experience they did not have everything this particular inspector was expecting — and so they have to do some more work before the sheathing inspection can be completed. But Angelito and his crew are working hard to get everything done so the inspection will go ahead next week. 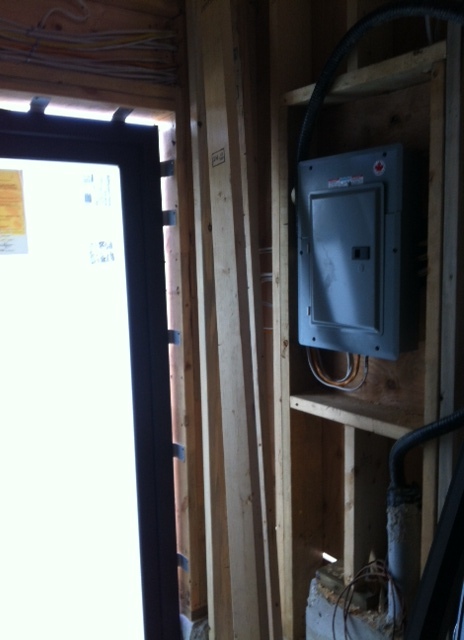 Then insulation and drywalling can go ahead. We had a lovely chat with Novell tonight at our regular debriefing. We received their assurance that this blip on the radar will be overcome and everything will go ahead as planned. Lights for the bathroom and the bedroom are either in hand or on order. The hallway lamp is ordered (from Germany), and we are in the process of picking the perfect lights for outside the front and garden doors. The deck lights will be installed very soon. Posted in Laneway House and tagged Lane Home, Lane house, Laneway House, Small House, Small Style. Bookmark the permalink. We are being delayed by an inspection that hasn’t been completed. It’s complicated (as you may have guessed) but since inspectors are human and since they each have their own criteria as to what should be completed when, we have to get some more work done before the sheathing inspection is completed and signed off. This is a disappointment, of course, we will be meeting with the nice folks from Novell on Friday to get everything straightened out. It’s a baby living roof. 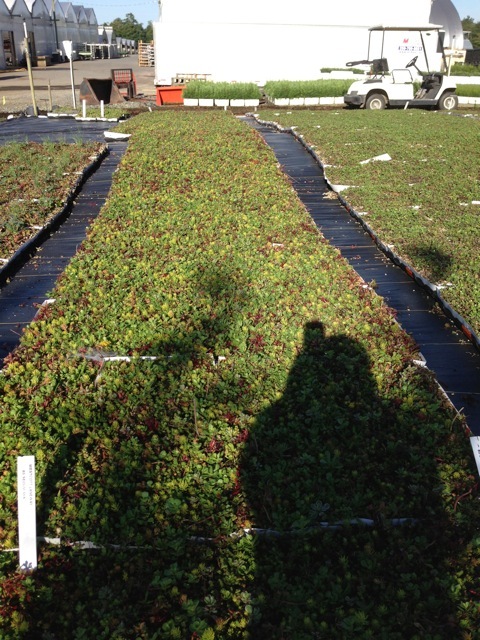 More to the point, it’s OUR living roof, growing up all big and strong out in Langley, waiting to be delivered to us and placed on our home in just a few weeks. A live roof many storeys in the sky. Ours will look nicer, of course, but it’s an idea of what we can expect. 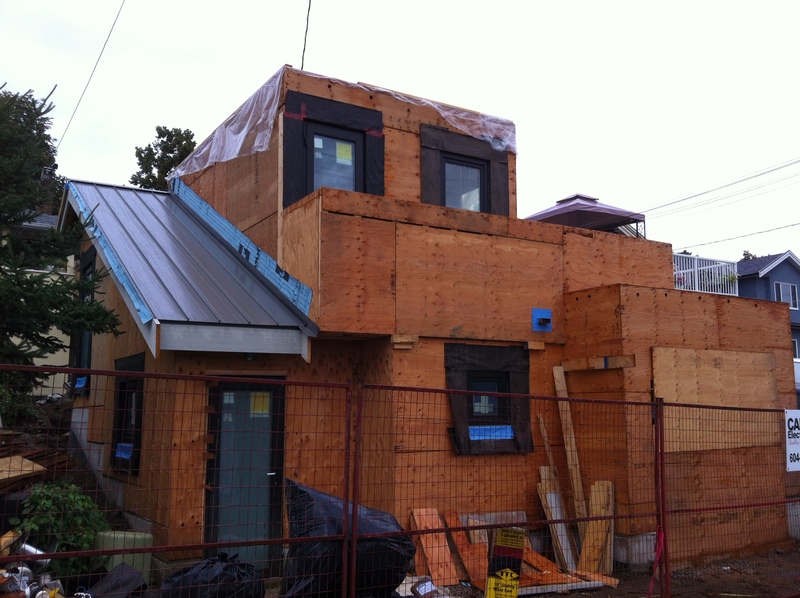 Posted in Laneway House and tagged Lane Home, Lane house, Laneway House, living roof, Small House, Vancouver. Bookmark the permalink. BC has an embarassment of riches as far as vacation locations go. This summer I’ve already been to Nelson and Christina Lake, British Columbia (sweet!). But for our regular summer vacation, we always head to Penticton. We stay at the same hostelry every year, perfectly placed for maximum walkability, close to the beach, pool, friendly owners — we love it. 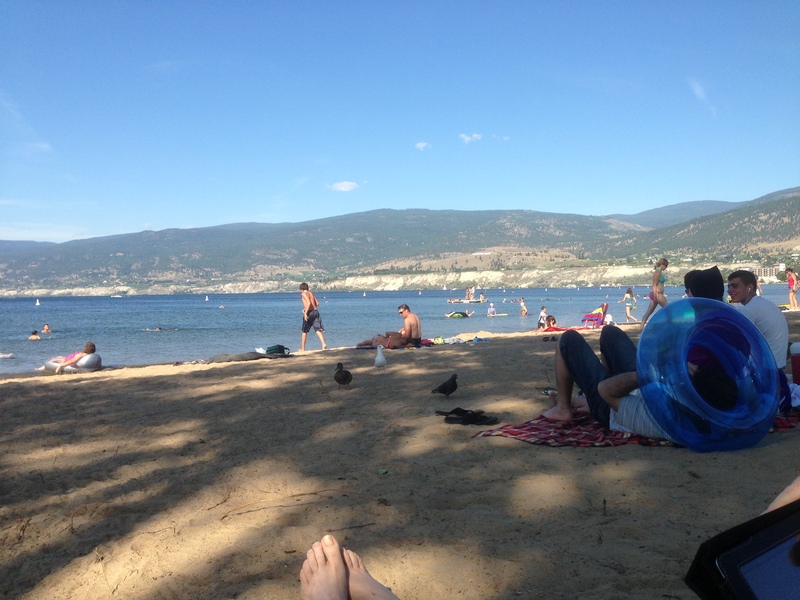 My favourite view of Penticton — toes, beach, lake, hills. But what did it teach us about how we are going to live in the laneway? Well, we lived in a small suite with one suitcase full of clothes (between us) plus mis-matched pots, pans, dishes, and glasses. And it was fabulous. We bought food, drink (thank you, Okanagan wineries) and two beach towels (remind me again why storing things in a storage place is a one-way ticket to wasteville — our old beach towels are somewhere in “there”). We spent money on experiences (miniature golf, restaurant meals, ice-cream cones) (hey, ice cream is an experience!). And the wifi in our room is so dodgy we could only pick up our email if we stood at the kitchen counter or teetered on the balcony (we booked the same room for next year, so, yeah, we like picking up our email once a day). Letting go felt great. Of course we don’t believe that we are are going to be living such a simple life when we move. But we do understand that living with less is doable — and attractive. Sure it was only for a week, but it left us wanting more…..more “less”. Back home I am looking for ways to get rid of some of the papers that flood into our home. It’s a good start, and we will find a way to keep it to a minimum. Baby steps. Inspired by a week without mail. Posted in Housing, Laneway House, Life, Minimalism and tagged Decor, Lane Home, Lane house, Laneway House, Small House, Small Style. Bookmark the permalink. We dashed back after our week amid the beaches and peaches of Penticton to see what changes had occurred in the laneway and were significantly underwhelmed. From the outside, it looked as if nothing had happened. But when we got inside we could see that the electrician had been very busy. All the pot lights are installed in where the ceiling will be — that is going to be one bright home — and we could also see where the receptacles and switches will be. We are still trying to figure out one key part of the plan — the bedside lamps. We thought we had found the perfect lamp, but then heard from Laurel our designer that the electrician had said, yes, they could be installed, but they could not be hard wired in, and that meant a visible cord running down the wall. Why bother? We want built-ins! So we just slipped into the Penticton branch of a local lighting store and hope that we’ve found the perfect one. We’ll go over to their local branch to see if they can help us out. We got a little too clever for ourselves and looked in furniture and accessory stores for the bedside lamps before we went to a lighting store. We have learned our lesson. It’s still crude (like I said, I’m still learning) but we are able to visualize so much better — I cannot look at two dimensional drawings and “see” in my mind where things will go. For instance, we were hoping to use our current coffee table, actually a carved wooden chest with a slab of glass on it. But when I tried to fit it into the 3D rendition, it was clear that it would block the flow to the deck door. 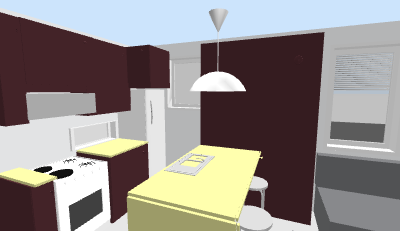 It looked possible in the floor plan, but in 3D it was unworkable. 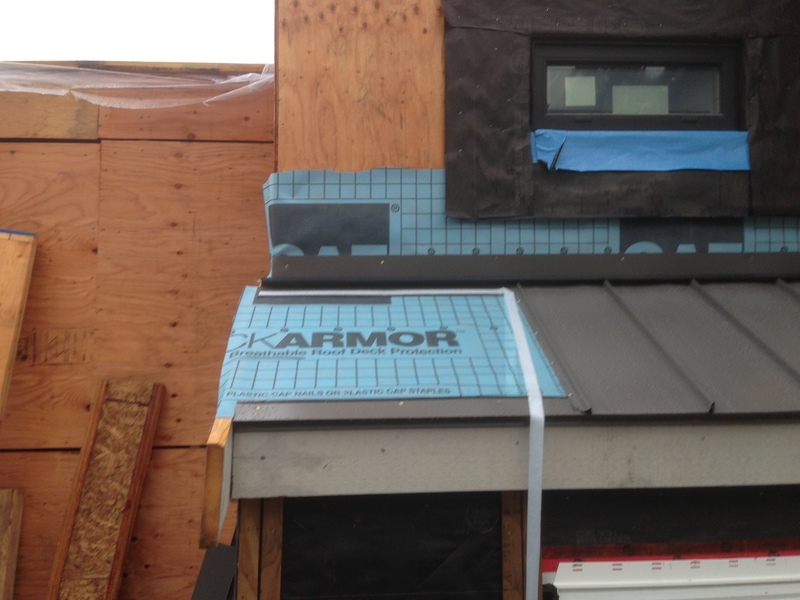 What is ahead for us is: electrical and outdoor sheathing inspection, building paper and rain screening, then the metal roofing and siding installation. 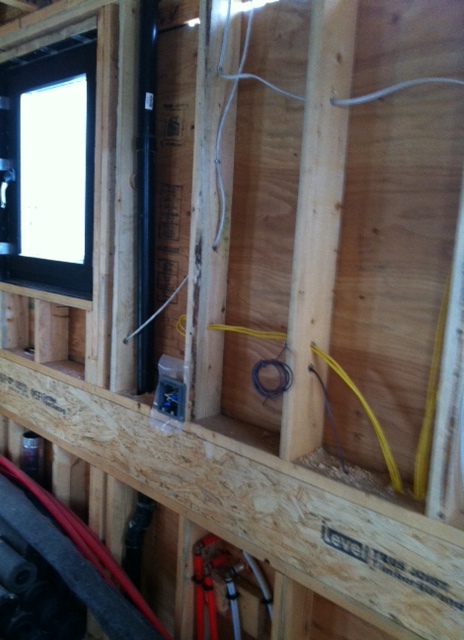 Then more inspections and then…..DRYWALL! So we are going to see some major changes soon. Also we are waiting for the city to connect the water to the main house and the laneway — that will mean the main house can fill in the trench that currently leads from their front yard to the laneway — ugly and dangerous with a toddler around. 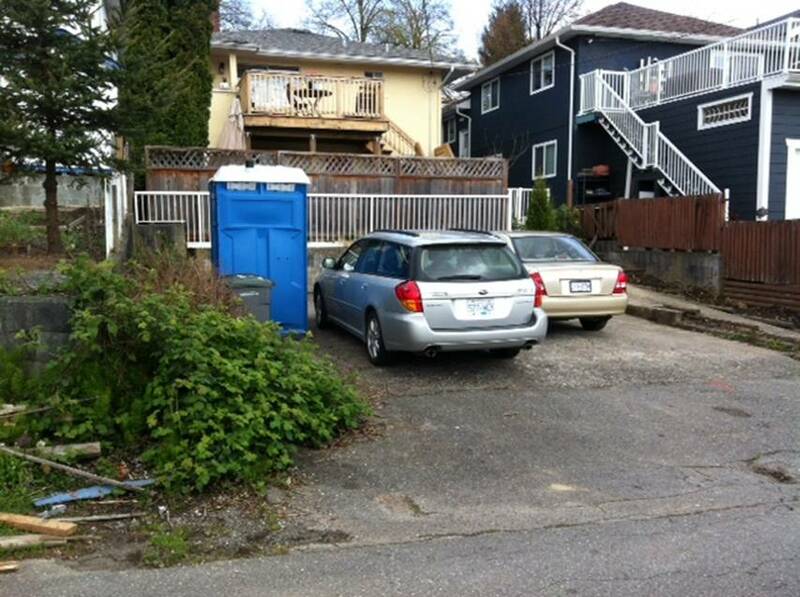 Posted in Cities, Laneway House, Small House and tagged Lane house, Laneway House, Small House, Vancouver. Bookmark the permalink.